Las Vegas invented the VIP experience, and they continue to redefine what it means to be indulged. 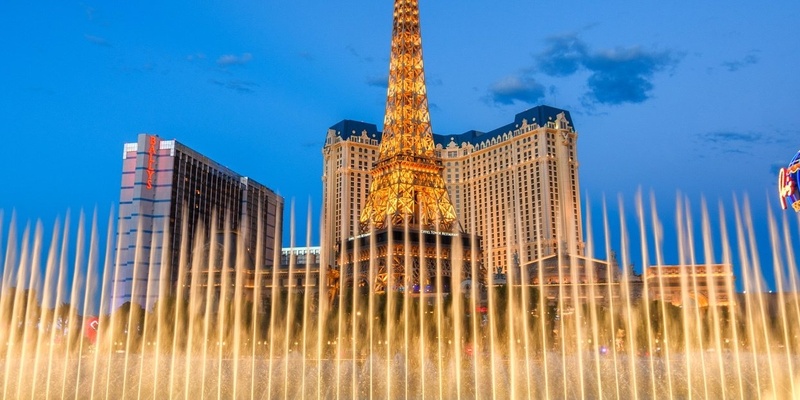 Whether you want playlist control and a front row fountain seat at Hyde Bellagio (for a cool $250,000, with drinks delivered by the Super Mario Brothers) or a Villa at Caesar’s Palace that boasts self-playing pianos, private celebrity chefs, and remote-controlled toilets, Vegas has you covered. As a company that champions remarkable experiences, we know there’s a lot to be learned from the way Vegas treats its guests. It’s the perfect place to find inspiration if you’re looking for ways to step up your guest experience game. We’ve pulled together some Sin City tricks of the trade that could work for any event to get you started. It’s the same concept that makes you feel welcome in the home of a great hostess. A guest should feel they’ve been thought of ahead of time and that their presence is an important one. After all, few things make you feel more important than when little details were clearly designed with you in mind: your favorite music is playing when you check into your hotel room instead of stock smooth jazz; when you arrive at the theater, you are greeted by name and led to your seat with a smile; your massage chair relaxes you to the rhythm of whatever song you’re listening to (this is, of course, an actual thing in Vegas). Anything you can do to include someone’s name or personal preferences into their experience goes a long way in making them feel like a guest – not a number. This can be accomplished in communications, greeting during events, and in the way you prepare materials and spaces ahead of time. We all love a little something extra, don’t we? A complimentary upgrade we didn’t expect, a personal tasting of a new dish the chef is trying out, or early access to, well, anything. It’s a little like winning the experience lottery because you always expect what you planned and paid for, but the extras are the most exciting. Even if those exclusive pieces are paid for, that is what sets their experience apart from everyone else’s. Try adding in tiers to your event, so guests can choose to upgrade their own experience if they have the budget. You can also plan ahead for upgrades, extras, or surprises that you present to VIPs, influencers, or other guests for free – this way, you’ve budgeted for it and they still get the surprise of a complimentary perk! Here’s the scenario: Your high-profile guest is all set for the trip of a lifetime; their expectations are high, and your team is all prepared to exceed those expectations, but in hospitality, you have to expect that things will go wrong. Planes may be delayed, rooms aren’t always ready on time, or rain ruins plans for a rooftop event. It’s how you respond that defines your guest’s experience, and this is where many fall short. When you’re dealing with VIPs, you should take every opportunity to make up for inconveniences and disappointments, even when they weren’t your fault. Don’t just correct the mistake – take the opportunity to go above and beyond for their trouble to leave a lasting impression of quality. Sometimes it’s going to cost more, but Vegas hospitality icons know that the small extra cost is well worth the customer satisfaction and loyalty. If a guest’s room isn’t ready, provide them with complimentary champagne while they wait. If the VIP table they reserved got moved around, comp their meal and invite them back. The Las Vegas commitment to VIPs provides endless inspiration. If you want to see how executing on that commitment becomes easier with concierge.com, visit our software page. And, of course, a little reconnaissance trip never hurt, right?